For the past 7 sessions 10 day SMA of TRIN is in rising mode… which is a bearish scenario for short term if 10 day SMA of trin crosses above 1. 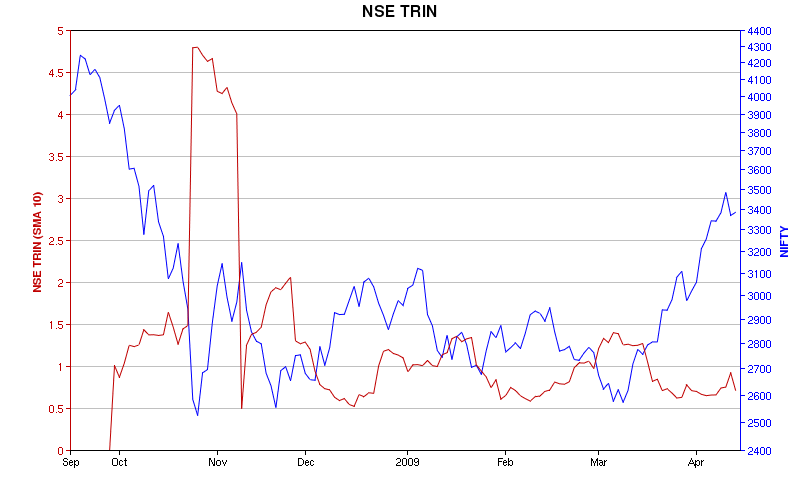 But today there is a sharp dip in 10 day SMA of TRIN suggesting that nifty could test higher levels in coming session. please check this sitehttp://stockcharts.com/school/doku.php?id=chart_school:technical_indicators:trinit says when TRIN is below .8 then markets are supposed to be over bought.A number of TRIN interpretations have evolved over the years. Richard Arms, the originator, uses the TRIN to detect extreme conditions in the market. He considers the market to be overbought when the 10-day moving average of the TRIN declines below .8 and oversold when it moves above 1.2. Other interpretations seek to use the direction and absolute level of the TRIN to determine bullish and bearish scenarios. In the momentum driven markets, the TRIN can remain oversold or overbought for extended periods of time.